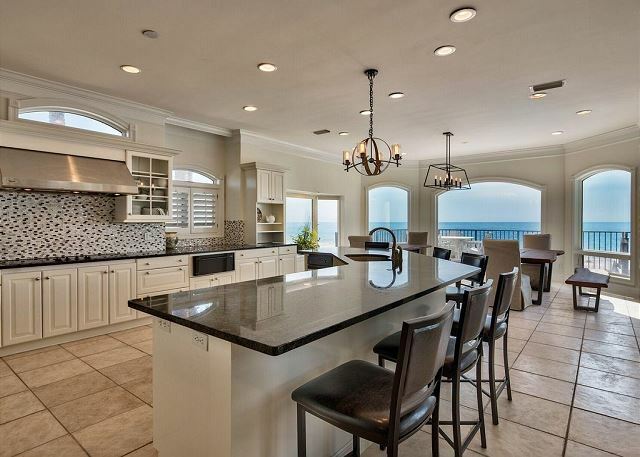 This luxurious property is located on beautiful scenic highway 98 in Destin, FL. 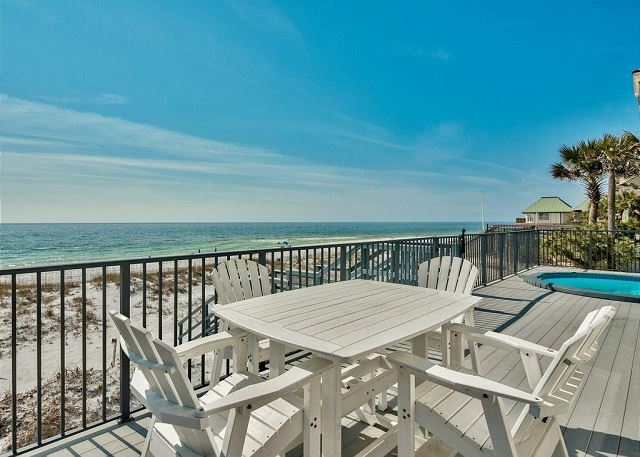 Just a few mintue drive from fun family attractions like the SilverSands Premium Outlets, The Destin Commons, and Grand Blvd. With all that is around, you are always only a quick ride to fun family activities, delicious restaurants, and desirable shopping strips. 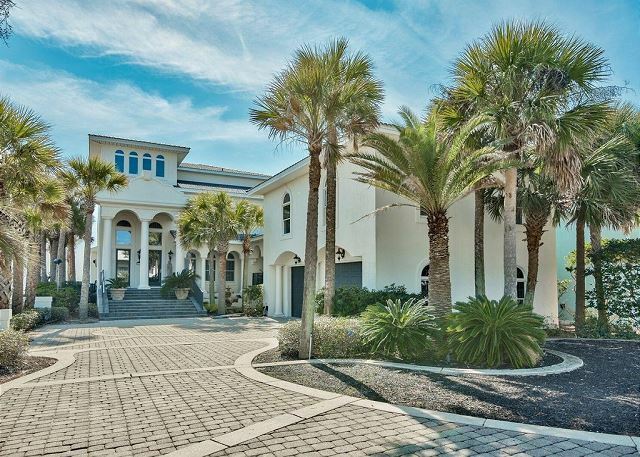 The moment you turn onto the driveway at the Destin House, you are welcomed with it's large paved driveway, tall columns, lined palm trees and elegant style with immaculate craftsmanship unlike many homes in the area. 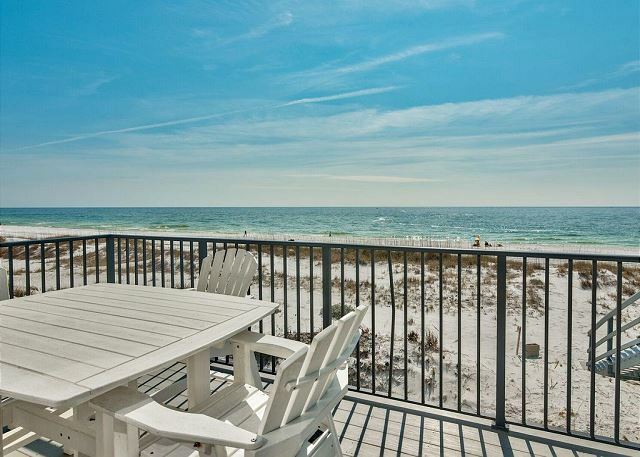 Located directly on the Gulf, this property provides beautiful Gulf and Sunrise/Sunset views from all three floors that you and your family are sure to enjoy as you sip your coffee in the mornings or share dinner on the back porch. This spacious plan boasts over 5,800 square feet, each of the three floors acting as its own unique space. 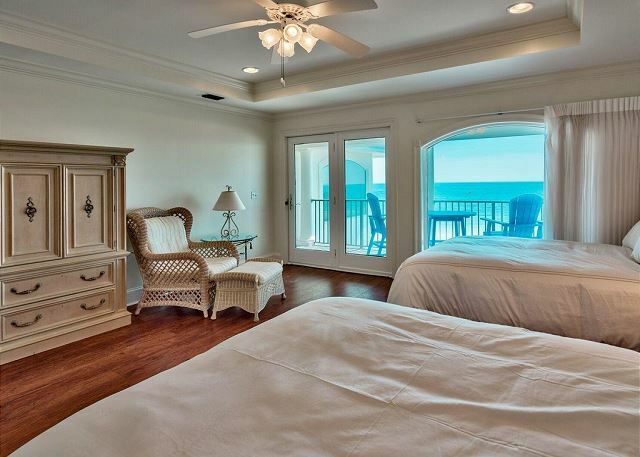 With 8 bedrooms, 7 full + 1 half baths, and private gulf front pool, this vacation rental is perfect for any occasion. 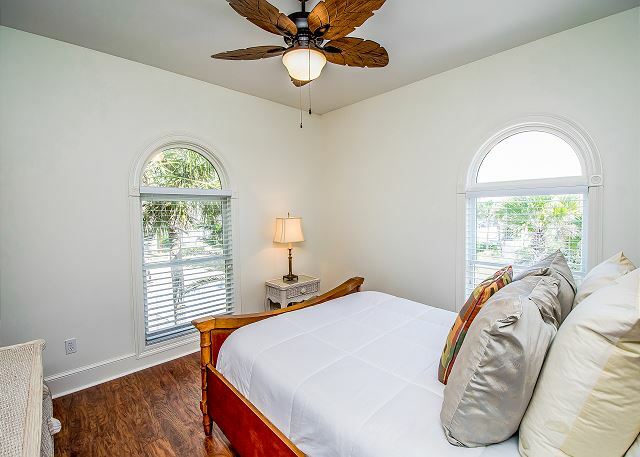 From family reunions, to church retreats, girls weekend getaways, to multi-family vacations, this home is certainly the home for you. 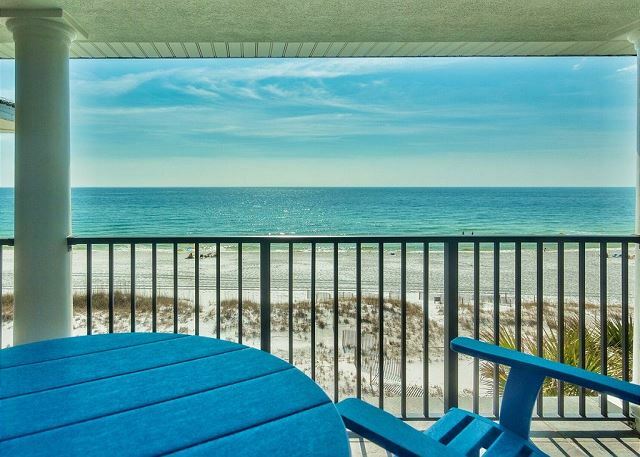 Just steps from the sugar white sands, The Bellagio brings unparalleled luxury and elegance to beautiful Destin, FL! Property was amazing. The only concern was when it stormed, it rained inside the house. The rain leaked to second floor. We rented this lovely home in early November 2018. It was ideal for the 5 couples staying there. 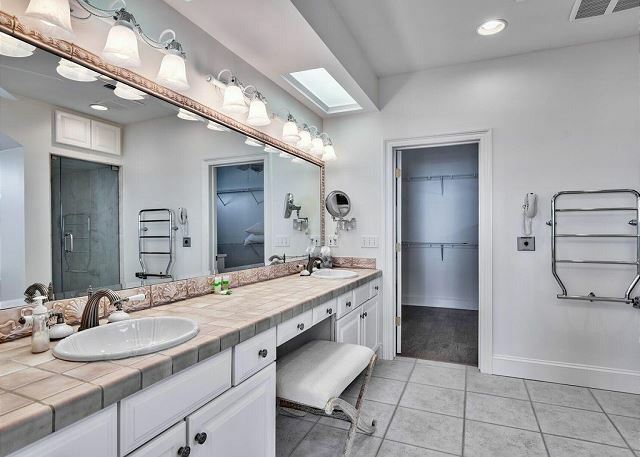 Plenty of room to relax together, and still enjoy our own privacy. Benchmark Management did a fabulous job. We had minimal service request, but they were very responsive and a delight to work with. Our son got married a few houses down the road on the was so nice to walk down the beach to his wedding. 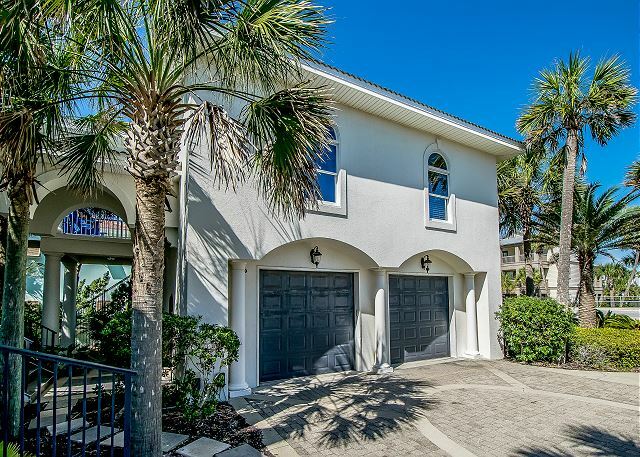 We loved the beach and the heated pool...I would highly recommend spending the extra money to heat the pool.The kitchen was well equipped and we love to we notice that feature.. Thank you for your kind words Carol! We are so glad you enjoyed your stay at The Bellagio - and a huge congratulations to your son on his wedding! We couldn't agree more - The Bellagio is a wonderful choice for several families to vacation together! Plenty of space for wining, dining, cooking in or playing games! There is something for everyone here! 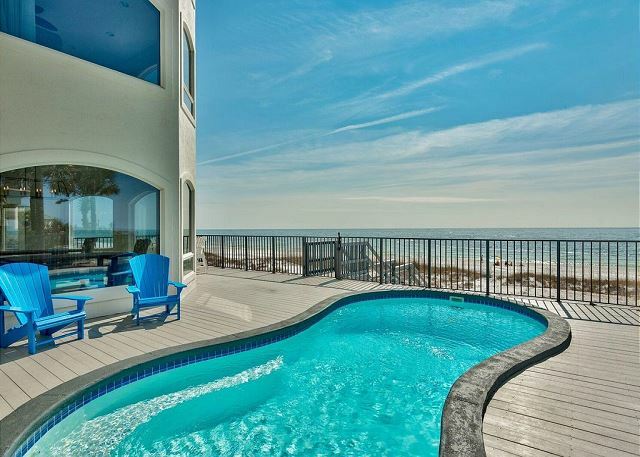 Want to be a home-body - go from your morning coffee to the heated (additional cost) pool to a walk on the beautiful sandy shores of Crystal Beach and back home for an evening cocktail on the balcony - best views in town! Like to get out and see the sights - lots of shopping and fine dining just minutes away! Bring your wedding, your class reunion, your work retreat or just your family and we will help you relax and enjoy! Call Benchmark today for The Bellagio experience! Thank you for submitting your review and we are glad you enjoyed your stay at The Bellagio! Sorry we couldn't make the rain go away for you - maybe next time! 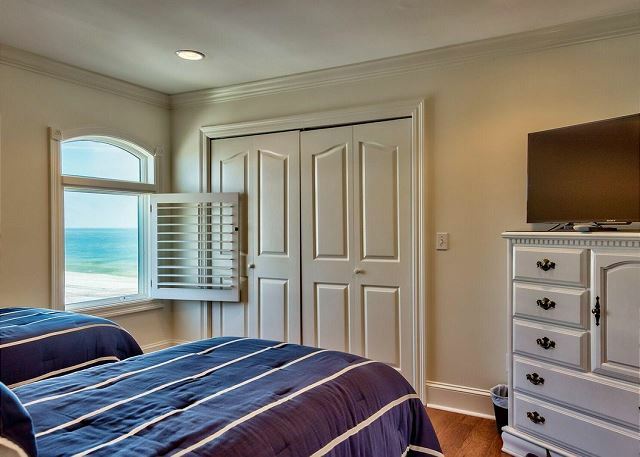 Looking for an out of this world vacation rental? Want only the best? Then call Benchmark today and let us tell you all about The Bellagio! 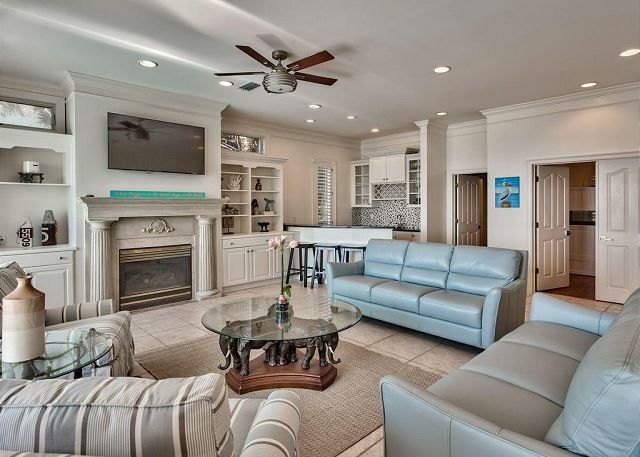 This wonderfully decorated and equipped home is located right on the Gulf of Mexico - just walk out the patio doors and right down the steps to one of the most perfect scenes you will ever lay your eyes on - white sand, glorious sunshine and the tranquil waters of the Gulf - and just maybe a dolphin or two will delight you with their playfulness! Get your family members together now to secure your spot and make memories that will be talked about for years to come! Great place to meet for a family Christmas. The property was clean and well stocked. The heated pool was great. The furniture, beds and elevator were very nice. Our only negative (slight) was that we could have used more towels and paper goods. Thank you for submitting your review! We are so glad you enjoyed your stay at The Bellagio - this is the perfect getaway - family holidays, reunions, weddings - The Bellagio is a great place to create lasting memories! 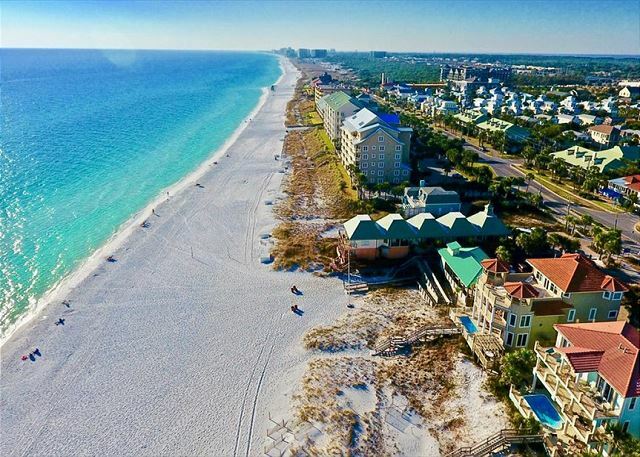 Located directly on the Gulf of Mexico - gorgeous white sandy beaches and beautiful turquoise waters - it is paradise on Earth! Your own private pool and several great eating establishments close by make this the perfect spot for your next special occasion. Bring your big family and all of your friends for a party - lots of space where everyone can be together and lots of space to spend some alone time as well! Sounds like the perfect place for you? Call Benchmark today and we are happy to get you all set up! The house was beautiful, the pool was perfect for the three kids, and the home was definitely big enough for the 25 adults. We never felt like we were on top of each other. We loved the fact that it was right on the beach and we had our own area in the front of the house to set up on. We had water issues the first day but the rental company took care of it right away. Only thing we had a small issue with was parking but we managed. Thank you for submitting your review, Brooke - we are so glad you enjoyed your stay at The Bellagio. 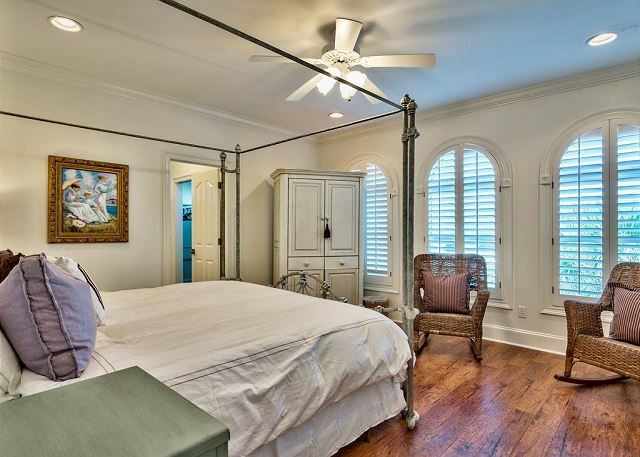 This is a one-of-a-kind property where luxury meets comfort - there is a space for everyone! 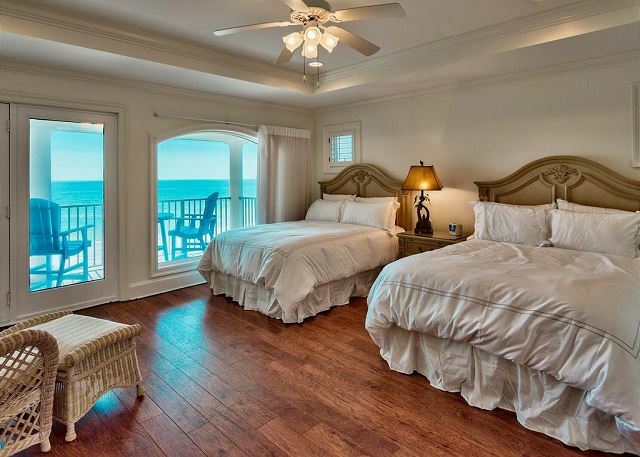 Located right on the white sand of Crystal Beach the sites could not be more amazing - and when you are able to spot the dolphins playing right out in front of you then you will know that you have made the perfect choice for your beach vacation. Wedding? Family reunion? 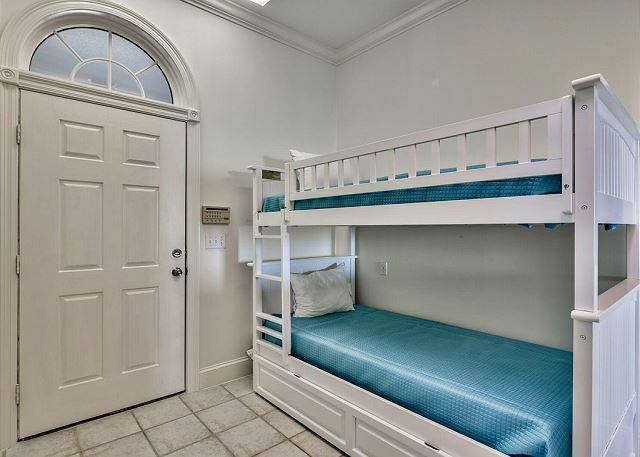 Getaway with your college roomies? Yes we can do that! There is so much to love about this home so call Benchmark today and ask all of your questions. We would love nothing more than to help you secure the perfect vacation! I've stayed in a lot of houses like this. The 2nd floor master has the best view I've ever had. The house was clean, the pool was a decent size, and it served every need we had. Parking was a little tight and the pool table was in the carriage house, but neither of those things were enough to warrant a bad review. We were here during Hurricane Michael and the management team did a great job of communicating with us even though they were being evacuated. It was a great experience. Thank you for submitting your review! We are so glad you weathered the storm and stayed safe - it was quite the experience for sure! Thankfully our area came through with minimal damage and we are here to welcome all of our future guests! 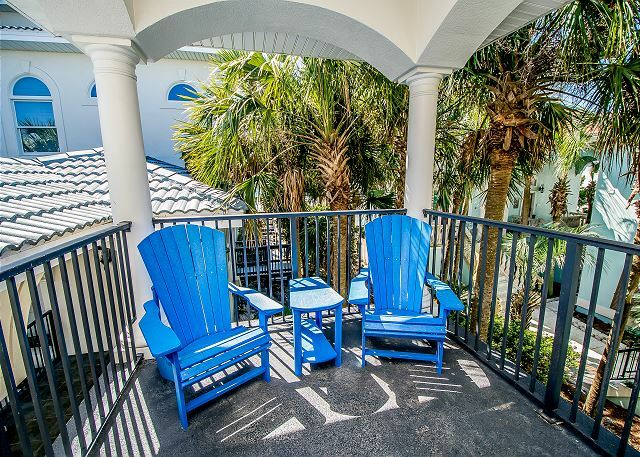 The Bellagio is definitely a "must-do" - a spacious, beautiful home, captivating views of some of the most gorgeous beaches in the world and conveniently located within minutes of shopping malls and fantastic restaurants! Want it all? The Bellagio has it all - call Benchmark today and we can cross this one off the bucket list! We had 11 mature women celebrating 3 big birthdays and couldn't have picked a better place to do it! The home was spotless, better than the photos and had a super responsive management team. The pool was, as mentioned in other reviews, on the small side, but it fit our purposes. (our weather was cool so no swimming in the gulf, but the heated pool was relaxing). We had a little issue with the pool heater and they sent a guy out immediately. The home is in a great location, but was so nice we hardly left the premises. It is directly on the gulf and 5 beach chairs where set up daily by the "cabana guy". We cooked dinners in the beautiful gourmet kitchen and found most of what was needed, I think we were missing a agrlic press, but used a micro planer instead. There was a separate bar area which was great for crowd control! We loved the big windows with the amazing views. We loved the big grill (did not used the green egg smoker), comfortable beds, ample parking. 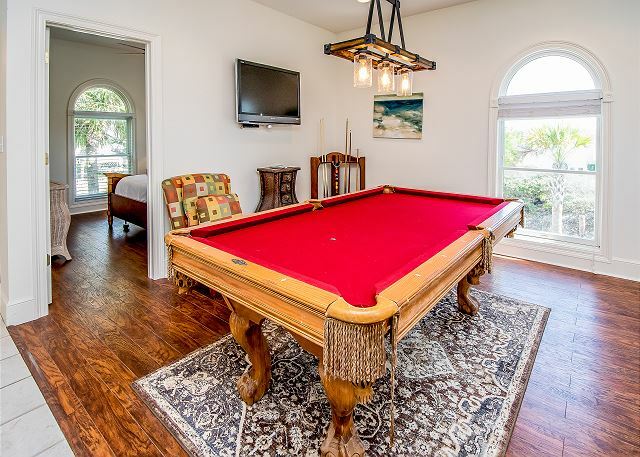 We did not use the carriage house, but saw there was an available pool table. All in all, everyone had a great time and loved the home, we would definitely stay here again, and again and again! Thank you so much for submitting your review! Don't you just love girls' trips!! We are so glad you chose to stay and celebrate with us at The Bellagio. This is the perfect place to do your celebrating for sure! So much room between the main house and the carriage - there is a space for everyone. And if you are like me my space would be right down the boardwalk to the beautiful white sands of Crystal Beach! This is one of the most amazingly pretty beaches in the entire area. 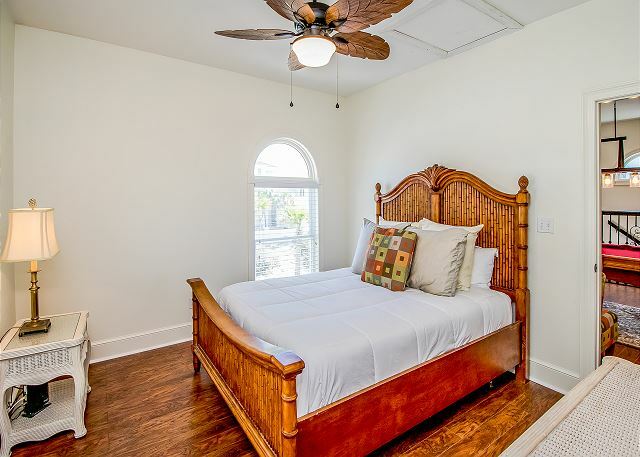 You can view the beach from several locations within the home which is very calming and relaxing but when you are ready to party this house has it all as well! 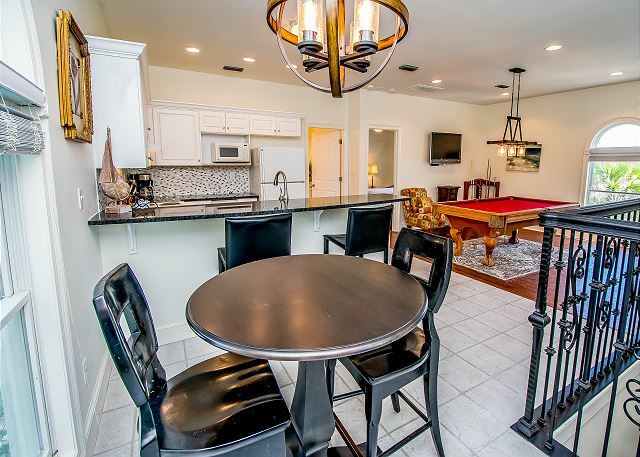 A wonderfully spacious kitchen, room on the deck around the pool to gather, a pool table in the carriage house - there is something for everyone! 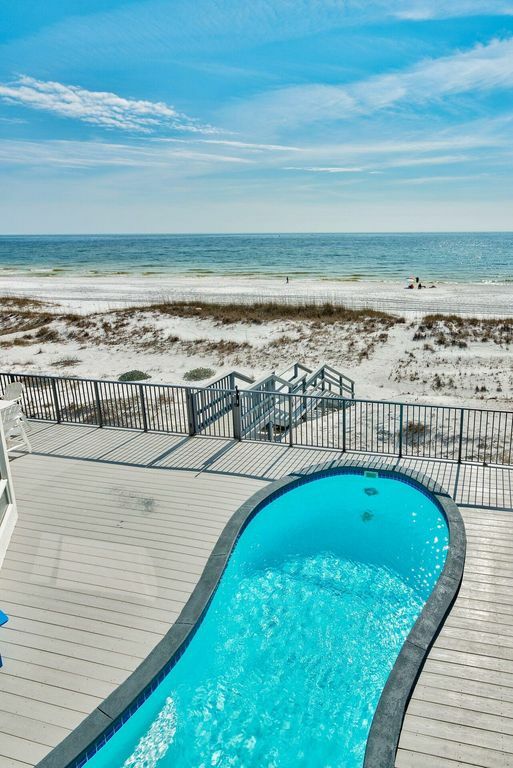 This is an extremely popular vacation rental so you must call today - we are booking the 2019 season - do not miss out on this one! Call Benchmark today! The house was the perfect location for our company retreat. 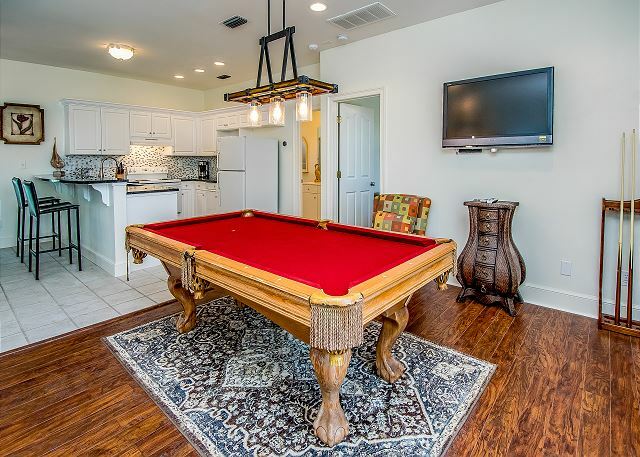 We enjoyed the grills, pool, kitchen, pool table and the layout of the house was just what we were looking for. The management company was quick to correct the few issues we came across. Internet was our biggest issue. It was not throughout the house. We are a tech company and having internet in all corners was something we really needed. But we still would recommend the house. Brandy, Tyler, Christina, and Jude were all great. Thank you for submitting your review! We are glad that The Bellagio worked out well for your retreat - nothing like working while viewing the beautiful turquoise waters of the Gulf! Regarding the internet - we do apologize that the service had difficulty keeping up - we usually do not have over 30 computers running all at the same time!! 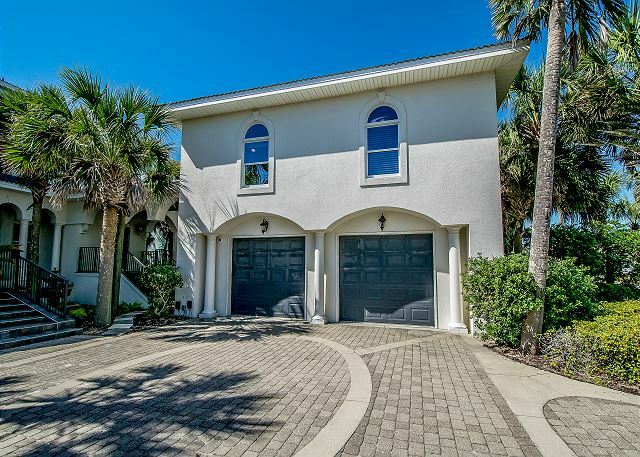 This home is truly amazing - from the views to the large gathering space to the proximity to great restaurants - there is something for everyone! An experience at The Bellagio is like no other - let us make your reservation today and give you the vacation experience of a lifetime! 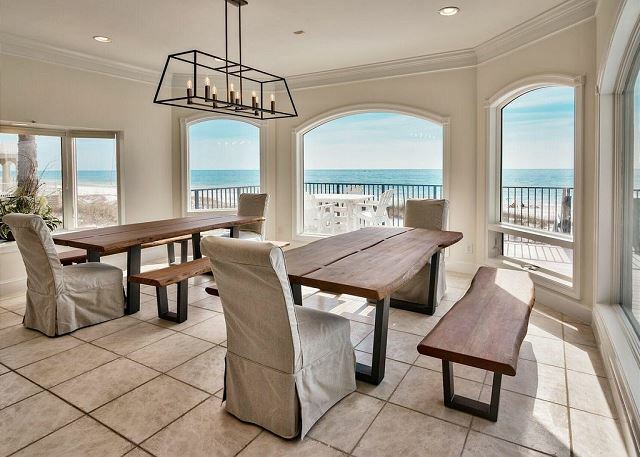 The home is well equipped and on the beach. 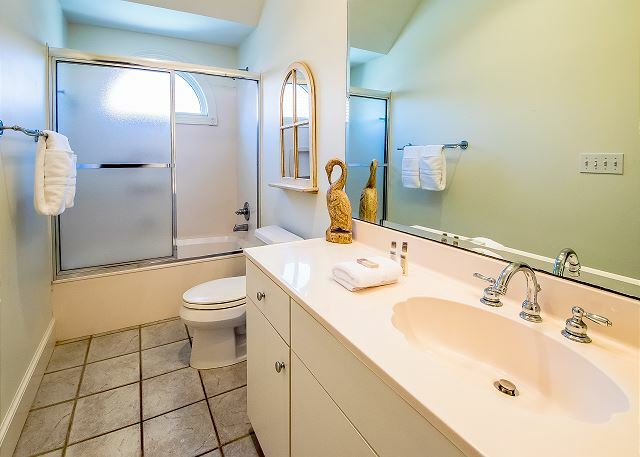 In a very nice neighborhood within walking distance of conveniences. Our company wanted a teambuilding venue where we wouldn't all go to our hotel rooms at the end of the day. 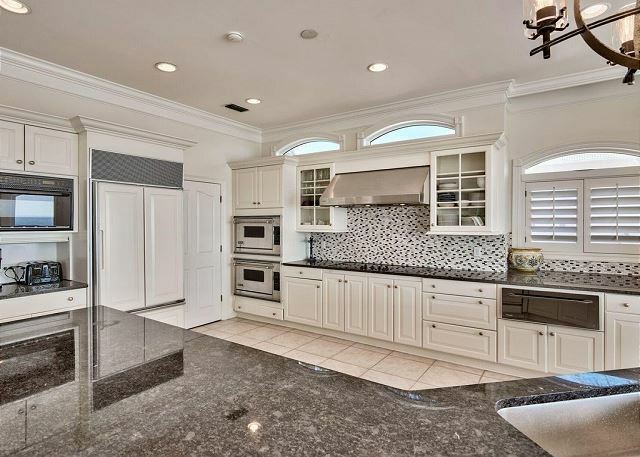 The 8 bedrooms and lovely kitchen and common area fit the bill. Thank you for taking the time to submit your review! We are so glad you enjoyed your stay at The Bellagio - what's not to love about this place! 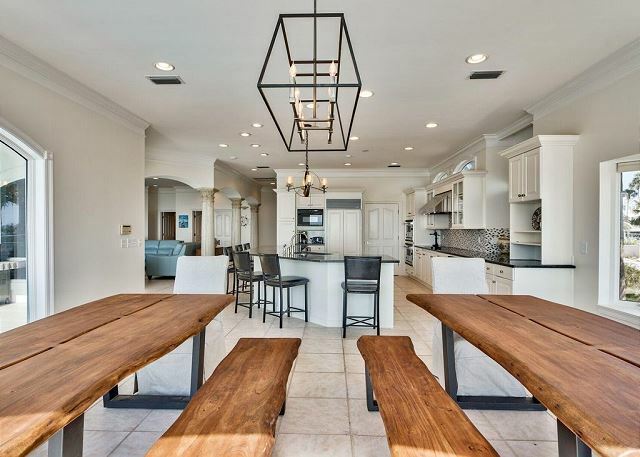 Beautiful kitchen area with new countertops and a custom refrigerator with plenty of space for everyone to gather - all while looking out at the turquoise waters of the Gulf! 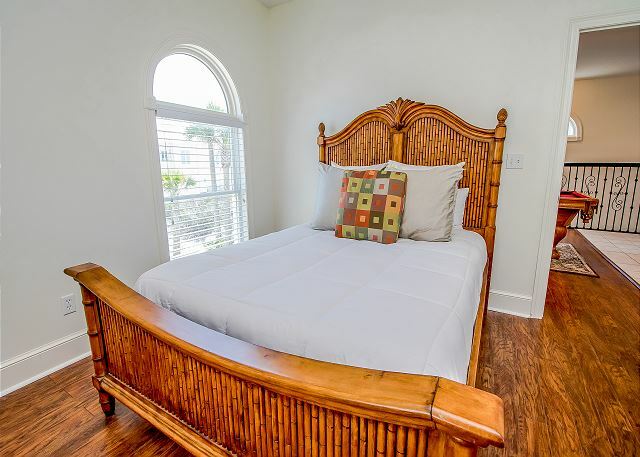 Lots of bedrooms so that everyone can have quiet time when needed - with balconies to enjoy your morning coffee while watching the dolphins play! We hope that you will call soon - only limited reservations left for this year - do not miss the opportunity to experience The Bellagio! Thoroughly enjoyable December 2017 Stay! Our family of 20 from all over the US stayed for a week over the 2017 Xmas holiday and had a fabulous time at the Bellagio. 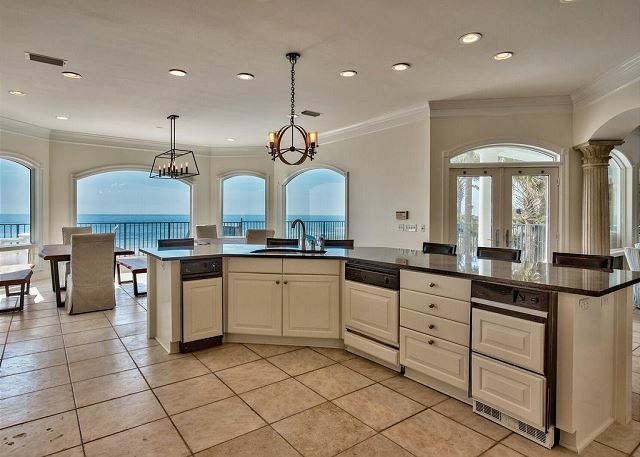 The house and beach are gorgeous and clean. A bit of work in progress in carriage house was no problem. The management was very helpful and their crew rapidly responded to our requests. One suggestion is to install a garbage disposal. We would be happy to have a chance to return to this terrific location. Thank you for your review. We are so glad you enjoyed your stay at The Bellagio and we would welcome you back anytime! Thank you for your patience while the owner continues to make wonderful improvements at this property - all of which are being made for the comfort and enjoyment of every guest! 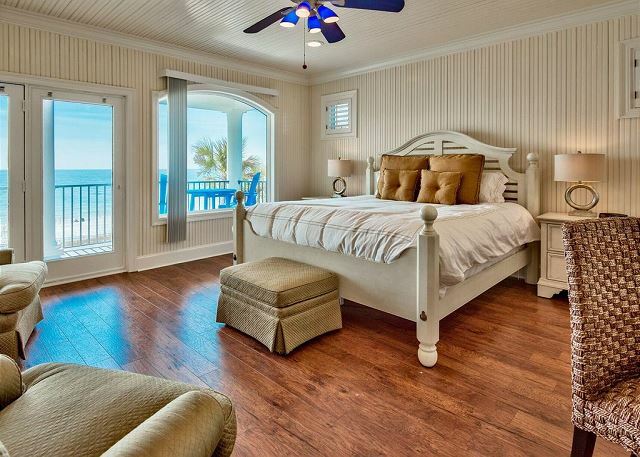 The Bellagio is a great beach getaway location and is big enough to accommodate large families. And you said it - the beach is GORGEOUS!! This property is truly amazing and it is booking quickly so please let us know if you are ready for your Bellagio experience! Thank you for taking the time to submit your review! We are so glad you enjoyed your stay at The Bellagio! This is such a fantastic property - you must see to believe! The waters of the Gulf do not get more beautiful than right here on Crystal Beach! This is an experience that you do not want to miss!! 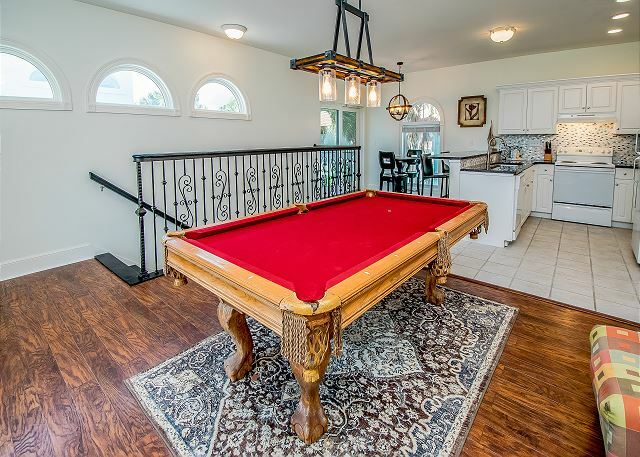 The house was as featured in pictures;however, pool was much smaller then anticipated from picture. Great short stroll to beach (directly on the beach). 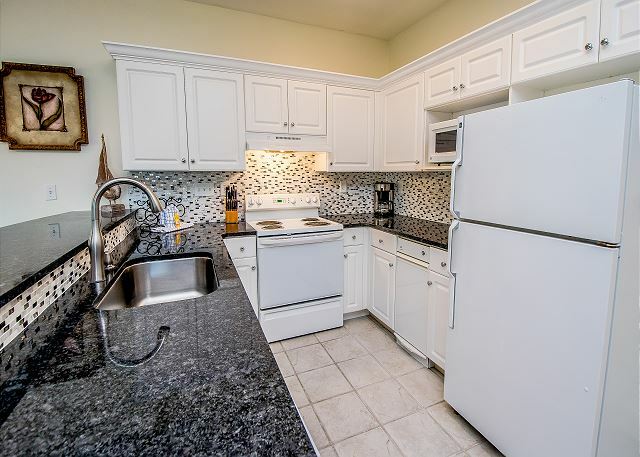 Close proximity to grocery, a few bars and several restaurants. All the Amenities was as described; though some of the kitchen equipment was rather dated (blender- a must use for tropical drinks on the beach)- which was a disappointment. The WiFi was slow as well; try re-setting router which did not help. 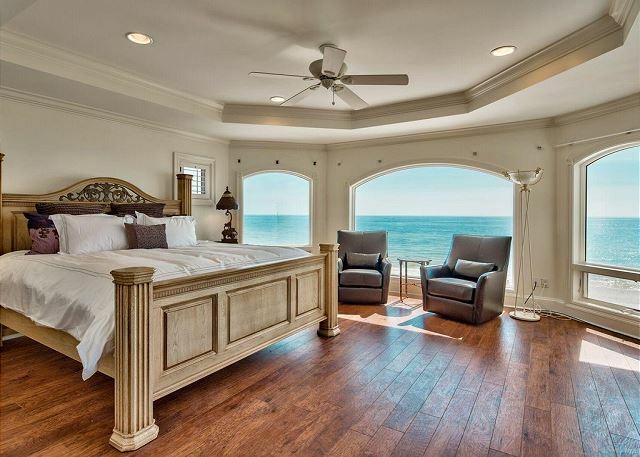 Lovely rooms and living room areas. I would recommend updating the grill to something bigger given the large size of parties that can come hear (we got by though dinner was done in batches). The property over-all was well mainted and clean though the carriage house did have a mildew smell. Good support from the managment property who responded quickly to our pool being unclean and filtration off. I would recommend a rental again for this property. Thank you for taking the time to submit your review. We do appreciate your comments and suggestions! 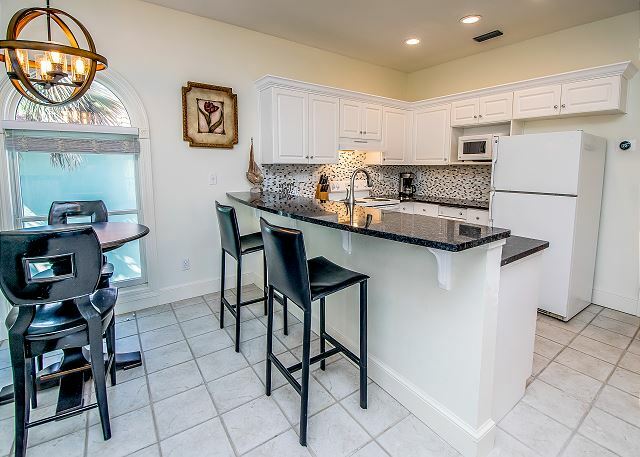 We are currently working diligently with the new owner of this property to ensure that all the conveniences are there for your use and enjoyment! We would be glad to have you come again any time! What a beautiful home. 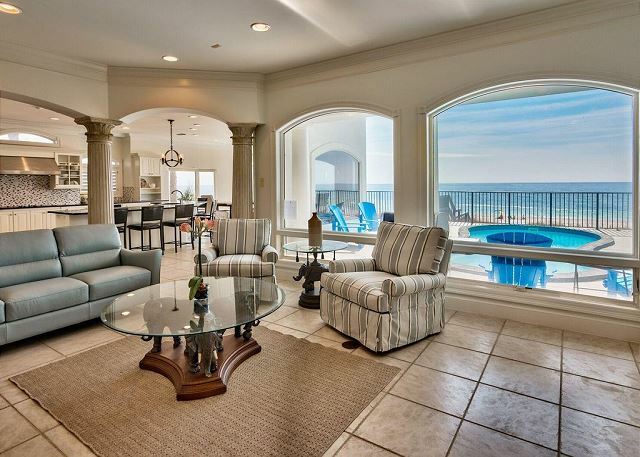 Gorgeous 3 story home RIGHT on the beach. Its a dream vacation. The Bellagio is that home that you pass on vacation and say" Wouldn't it be awesome to be able to stay there"! The view is a Million dollar view. We had a couple issues while there but Benchmark management stepped and did the right thing to help us. I would highly recommend a week at the Bellagio in Destin. Thank you for submitting your review. I know that from time to time things do happen but I am glad that we were able to take care of you and make things right for your family! We do hope to have you back again soon!